M3 Health is a strategic technology partner serving the healthcare and life sciences industries. With almost 20 years of experience developing and delivering innovative technology solutions, they enable their clients to better engage their audience, and solve the challenges they face to improve communications, drive sales, and ensure customer loyalty. When they decided to create a new product to address the challenges of connecting Pharmaceutical & Biotechnology companies to Healthcare Providers and Patients, they chose to build their technology solution using AWS IoT 1-Click, a new IoT service from Amazon Web Services. One of the main problems facing healthcare is maintaining effective communication between Pharmaceutical & Biotechnology companies and their stakeholders. Healthcare providers are dealing with complicated and growing volumes of information on the available treatments for their patients and need a quick and convenient way to connect to these companies to get the service they need at the time they need it. Patients have to maintain compliance with their therapy while continuing to manage the burdens of everyday life and navigating the puzzling roadblocks presented by a complex healthcare system, and need a way easily connect with their providers to get the help and information they need. Pharmaceutical & Biotechnology companies need a secure, clear, and engaging method of connecting to each of these stakeholders. AWS IoT 1-Click is a service that enables simples devices to trigger AWS Lambda functions that execute an action. The devices supported on AWS IoT 1-Click are pre-provisioned with certificates to securely connect to AWS IoT right out of the box. At launch, the service supports the new AWS IoT Enterprise Button to connect over Wi-Fi and the AT&T LTE-M Button to connect over the cellular network. You can use any of these devices to enable quick and easy customer interactions, while leveraging the power of AWS IoT and AWS Lambda to integrate with backend systems to schedule re-supply or deliver educational material. For further simplicity, the service also comes with a mobile app for configuration on the move. 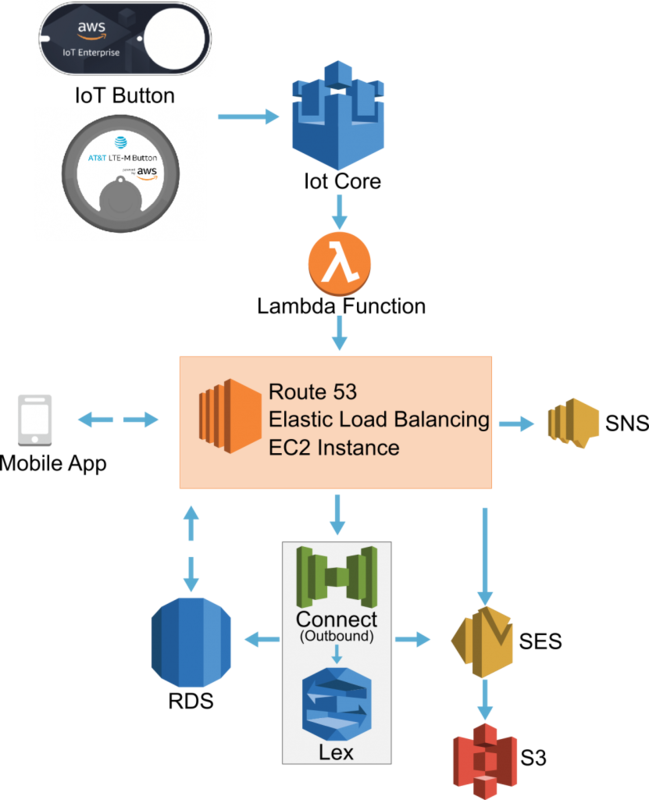 M3 Health leveraged AWS IoT 1-Click to build a solution called Ping™. AWS IoT 1-Click brings together all the features that M3 Health needed to solve the problem of Pharmaceutical & Biotechnology companies connecting to Healthcare Providers and Patients by enabling them to easily deploy thousands of buttons to customers without a complicated provisioning process. AWS IoT Enterprise and the AT&T LTE-M buttons are provisioned in advance at the factory, but the AWS IoT 1-Click app can also be used to perform just-in-time provisioning while a salesperson is visiting. Once deployed, Healthcare Providers and/or Patients can simply press their IoT buttons in their sample closet or medicine cabinet to contact sales repre sentatives and get the information needed in order to write proper prescriptions or get educational materials. AWS Lambda’s ability to integrate with other AWS services also makes it easy to attach other services such as Amazon Connect and Amazon Lex, allowing M3 Health to provide amazing automated language support through Alexa to both Healthcare providers and Patients.